With our first elopement wedding of the season only a few days away, I thought I’d ‘throwback’ to one of our weddings last october. Lynda and Nigel’s intimate wedding was gorgeous. They opted for no guests at all (a popular choice with elopement weddings). Those of you who have been to Ever After will know how peaceful it feels, even with 100 guests onsite. So you can only imagine how peaceful it must be with no guests at all! If you haven’t been to visit us then, 1. you should, and 2. here are some beautiful images which captured the magic of the venue on their special day. Just looking at those images is making me feel very autumnal… pumpkin spice latte, anyone? It’s always a treat going back through the flowers created for previous elopements… I love the colours selected for Lynda’s bouquet; soft but effective. 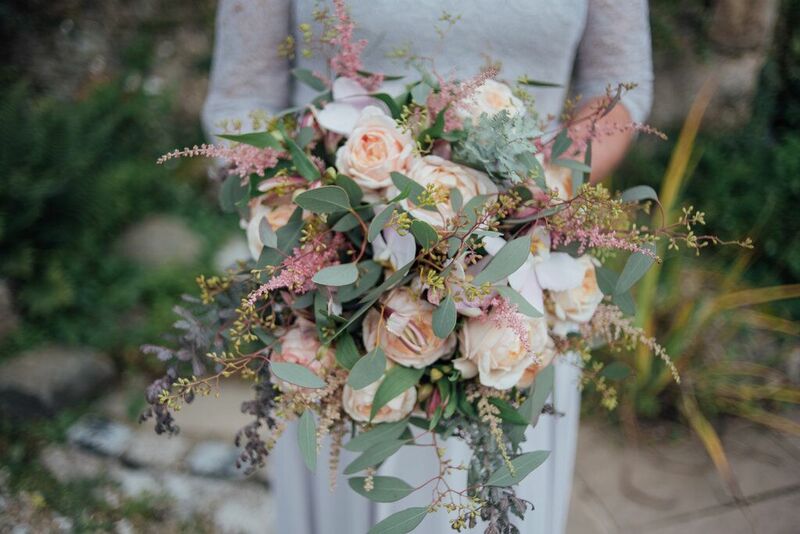 Plus, they grey of Lynda’s dress was complimented wonderfully by the pink and peach tones of the flowers. And not forgetting Nigel’s buttonhole! Now to throwback to probably my favourite elopement wedding cake(s) of last season (mainly because it meant one cake per person… what’s not to love?!). But seriously, how cute are these cakes?! They also had canapés for two, which meant a plate of canapés each… Scrumptious! Okay, forget the pumpkin spice latte… I want some wedding cake! Lynda walked into the ceremony alone, creating that ‘first look’ moment. With any wedding nowadays, but especially elopement weddings, the ‘walking down the aisle’ traditions are somewhat outdated. Brides don’t necessarily walk down with their father, bridesmaids more often than not walk down the aisle first, and in some cases the bride and groom will arrive into the ceremony together. What would your preference be? For more autumnal wedding inspiration, take a look at our autumn fever blog post.